Again, apologies for a lack of posts in the last few weeks. My father passed away recently and I was responsible for a lot of the planning. It was a physically and emotionally draining task that I’m just starting to recover from. Additionally, I moved shifts at UPS from the night sort, to driving trucks during the day so that has taken its toll on me through a serious change in sleep schedule and a major change in the physical output required of me. But I’m back, and taking a page from fellow Gunpowder Fantasy author A.S. Warwick (author of the Commonwealth Chronicles) I’m going to do a few posts on the people and nations of the world of Zaria. In addition to posting here, I’ll also be updating the Zaria Wiki to reflect the information. On a side note, in watching the Game of Thrones series on HBO, and having read the books, I was kind of looking forward to my wife’s reaction to the events of Episode 9 in Season 3. But alas, my wife read a spoiler on a wiki so there wasn’t any fun in that. So, I’m trying to figure out a way to keep the wiki up to date with new information as things change, but without having spoilers for new readers. If anyone is any good at making/updating Wikia entries, please feel free to give me some tips. Communications are the foundation of civilization. People need to talk to each other to coordinate. In Gunpowder Fantasy, your options are much wider than in other forms of Epic Fantasy. But what kinds of communications should you use, what are the pros and cons for your characters, or for your story? What if you want some of the benefits of a particular type of communication, but want to limit them at the same time? Those are the questions I’ll hope to answer. A network of swift ships carry messages from harbor to harbor. Sailing is usually a swift method of travel and can have the advantage of avoiding major land obstructions. Messenger ships can also bypass hostile territory more easily than a land-based solution. Sailing is not necessarily the most straightforward method of travel, and it’s entirely useless for landlocked territories. Messenger ships can also fall prey to weather and pirates. How can you mitigate or moderate these benefits, for the sake of the plot? The easiest way to mitigate the advantages of messenger ships is to create a world with limited access to water, or where most of the action is going to be inland. Another option is to create a world where pirates are common and known to harass messenger ships. Much like messenger ships, messenger trains are connected on a railroad to convey messages across vast distances. Messenger trains have the ability to cross vast distances quickly, aren’t reliant on the weather and can reach any place that has a rail depot. Trains are reliant on a rail system and on access to a steady supply of fuel. Messenger trains are relatively easy to mitigate. Limiting the availability of fuel will limit the ability of the messenger trains to carry out their mission. Being that messenger trains are reliant on a network of railroads, you can also have a disjointed network of rail systems. During the American Civil War, the South’s railroad network didn’t have a unified gauge rail, preventing a smooth transition from one area to another. The benefits of the Pony Express was that they were not limited to the rail lines. They were able to travel across rough territory quickly. The Pony Express relied on a network of relatively closely spaced relay stations, each stocked with horses and riders. This requires a great deal of investment and planning. Additionally, this system would be less than optimal in a war zone, with skirmisher lines and battlefields. Mountainous terrain would be a major way to moderate the benefits of the Pony Express. Another is to make mounts rare; without the ability to change horses (or whatever your choice mounted creature is) your riders will be forced to travel slower and be more careful about how they push their steeds. A Telegraph uses a network of metal lines and then transmits electrical signals along those lines that are part of a pre-determined code (the Morse Code was originally designed for Telegraph). Near instant communication between stations, as well as the ability to “tap in” to the telegraph line with the right equipment so you aren’t necessarily tied down to transmission stations (the AMC show Hell on Wheels uses this technique). Like the semaphore line, the telegraph lines can be “tapped”. If you know the code, you can decipher messages and transmit false ones. Telegraphy is also tied down to transmission stations. Like railway lines above, you can segregate the different regions of your nations or world. In the nation of Ansgar, there are 4 or 5 distinct networks of telegraph lines that are not connected. Instead, messenger riders have to carry messages from “network” to “network”. This allows me to build in a communications delay. You could also do this with differences in Code. Even if Network A and Network B are connected, if they use entirely different codes, the people at each end of the message will have to take time to decode the message and then recode it to the next network. Not only will this build in a delay, but it will require a typically small number of skilled operators. Remove those operators, and communication between networks becomes much more difficult. They were far faster than post riders for bringing a message over long distances. Messages could be quickly conveyed from one end of the country to the other with relative ease. Building an extensive network of towers, especially if they’re stone, could be expensive and take a lot of time to construct. Additionally, the distance that an optical telegraph can bridge is limited by geography and weather. A Semaphore line is also subject to having its messages intercepted by a watchful enemy and if an enemy was able to capture one of the towers and decypher the code, they could send false information along the lines. A magical form of communication is going to be dependent on whether or not you use magic in your worldbuilding and how that magic manifests itself. Crystal seeing stones, ala The Lord of the Rings Palantir, magical telepathy and magic mirrors are all variants of magical forms of communication. Depending on your system, magical communications can be instant, allowing for swift communication across long distances. Magical communication could also be private, with only the sender and receiver knowing what was said. The downfalls of a magical form of communication are also dependent on your magical system. Some downfalls could include a limited number of people capable of engaging in the magical communication, or a limited supply of magical reagents. The easiest way to limit magical communication is to limit the magical system in your world. Messenger birds have been used for millenia to convoy notes from one place to another. You just need to train the birds to what is their home, then move them to a different location. When you release them, they return to their home, with your message in tow. Birds are typically fast flyers and can ignore most terrain. Additionally, birds don’t have to worry about artificial fuel or feeding a crew of men. Birds are subject to predators. Your messenger pigeon will never reach its destination if an eagle eats it midway. Hunters are another concern. George RR Martin made a good example of this in one of his novels when he has one of the armies cut off a city’s means of contact by ringing it with archers. Very aggressive or over-populated predators would be a great way to mitigate the usefulness of carrier birds. If a certain species of eagle or hawk is particularly fond of your messenger birds, they are far less likely to survive the journey. These are just some of the major methods that you can use to communicate in your Gunpowder Fantasy world. A good series will include some or all of these. In the Ansgari Rebellion series, the nation of Ansgar uses telegraphs as their major form of communication, but official documents are moved by rail for physical delivery and post riders carry messages both between telegraph networks and to the telegraph stations from the surrounding area. PS: There’s 30 Days left in my Kickstart The Cerberus Rebellion Into Print Campaign and we’re 24% of the way there! Stop by and pledge if you’d like some awesome rewards! When I was in the middle of world-building the Griffins & Gunpowder Universe, I ran into a dilemma. I had a solid idea of what I wanted to do with this universe: I wanted it to be an epic fantasy but I wanted to bring gunpowder technology into it. The problem was that I couldn’t for the life of me find very much in the way of previous examples of how this was best accomplished. So I was debating dragging the whole universe back to the standard-fare medieval world, or taking it into a full-on Steampunk world. After some internal debate, some twitter chats with other authors and some googling, I decided to go ahead and make the world that I wanted to make in the first place. 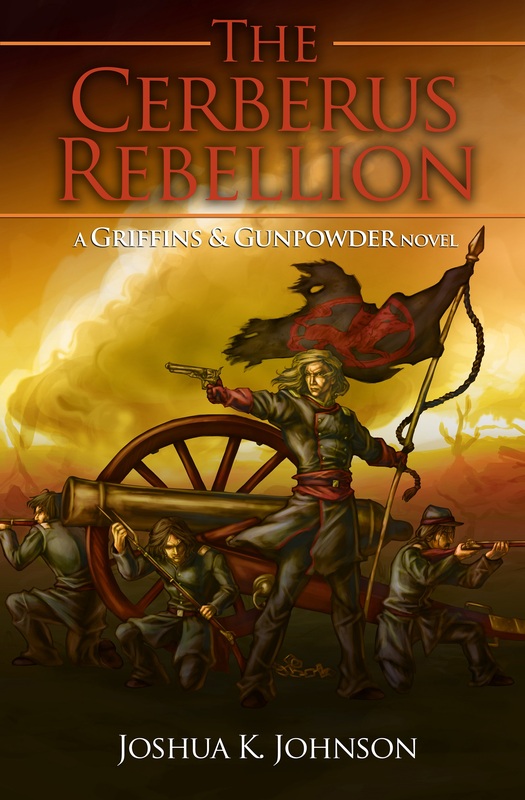 Now that I’ve released The Cerberus Rebellion and plowed into the Gunpowder Fantasy subgenre full speed, I find that it’s rather difficult to find marketing venues for it. The Griffins & Gunpowder Universe is between two worlds; not quite Traditional Epic Fantasy but definitely not Steampunk. So I’ve tried to reach out to the few other authors that write in the sub-genre and build a network of Gunpowder Fantasy authors. A.S. Warwick’s Commonwealth Chronicles (his website is here) would definitely fall into my definition of Gunpowder Fantasy, though he doesn’t go quite as far down the gunpowder/steam technology path as I do. 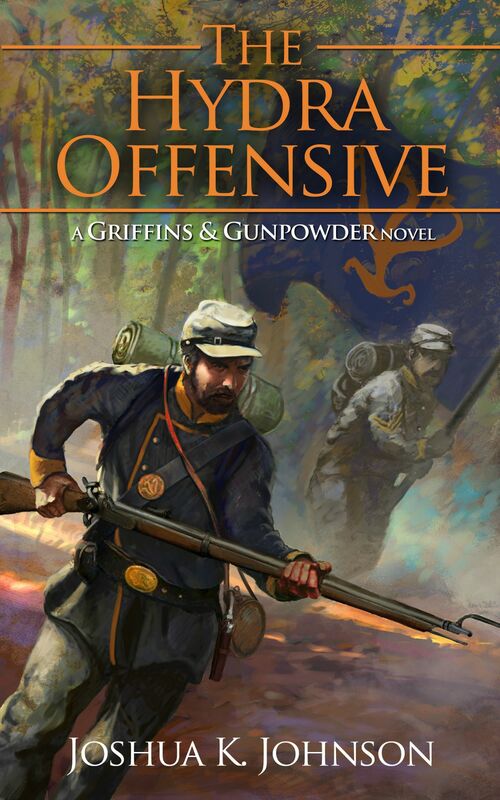 Where Griffins & Gunpowder is set in the mid-19th century with muskets being phased out, rifles common and the beginning emergence of cartridge-based revolvers, the Commonwealth Chronicles is set in a late 18th-century to early 19th-century setting. Muskets and smoothbore cannon are the dominant firearm in Mr Warwick’s world; rifles are rare, slow to reload and cumbersome. Another author whose world falls into Gunpowder Fantasy, though again on the earlier stages of the technological tree, is William King. His Terrarch Chronicles make heavy use of muskets and, from what I’ve read so far, very much include heavy magic use. The last author, and the one that I’ve had the most interaction and cross-promotion with, is Harry Vossen from A Way With Worlds, a world-building how-to. I had the chance to read some of his yet-to-be-released novel, Under a Burning Sky, and I was impressed. His work is definitely the furthest from my own; through the first few chapters (I haven’t had a chance to read through the full novel) Under a Burning Sky uses very little reference to gunpowder. In fact, Harry’s world is probably the closest of these selections to traditional Epic Fantasy. To the point I reached, muskets weren’t used and the only gunpowder weapons seemed to be cannons loaded aboard ships. The point of this post is to say that no matter how small you think your subgenre is, with the expansive nature of the internet and the booming eBook market, there is likely to be someone else writing something similar enough to your own works that you can draw parallels between the two worlds and help each other through cross-promotion. Starting today, The Cerberus Rebellion will be starting it’s last KDP Select Free Run. It will be free until 10/10 (Wednesday) so if you’ve been looking to pick it up, now is your last chance. Download it here or click the cover below! For those of you who don’t have a Kindle, I’ll be putting Cerberus up to the other major eBook vendors! One hundred years of peace and prosperity. War changes everything. Eadric Garrard was raised to believe that as the rightful King of Ansgar, his loyal nobles and fearful subjects answered to his every whim, no matter the cost or consequence. His decision to send his troops thousands of miles away will test that fear, and loyalty. Raedan Clyve was ordinary until an Elven ritual involving a griffin’s heart turned him into something more. Twenty years later, he still struggles with the magics that rage through his body. His mentor holds him back from his full potential and he faces pressure to find a suitable wife and father an heir. Hadrian Clyve has picked up where his father left off and works to expand his family’s influence amongst the Ansgari nobility. His aggressive negotiation of alliances and shrewd choice of marriage agreements has earned him respect, and resentment. When his King calls his troops to arms, Hadrian has other things in mind. After a century of scheming and decades of preparation, Magnus Jarmann is ready to bring his family’s plans to fruition by launching a war of independence that will free his people and return his country to its rightful place among the nations of Zaria. The King’s call to arms creates an opportunity that Magnus cannot afford to miss. In a war, little is held back; in a revolution, nothing is safe. A Novel of approximately 90,000 words. After you’ve decided on which aspects of traditional Epic Fantasy you intend to include in your world, you can look to the things that you will be able to do differently. Some “Gunpowder Fantasy” (A.S. Warwicks’ Commonwealth Chronicles, William King’s Terrarch Chronicles) lean more toward the early Gunpowder Era and maintain more of a Muskets and Magic feel. Who has access to Gunpowder in your world? Is it a common technology that nearly everyone uses, or is it in the hands of the few? Is there widespread production of gunpowder or is it a rare, precious commodity? Creating a world where everyone has gunpowder leaves your armies on a mostly even playing field. They all have access to similar weapons and have to make their advantages out of intangibles: strategy, tactics, etc. A setting where gunpowder is used only by the few can setup a massive disadvantage for one side or the other. You can put power into the hands of the producers by making gunpowder a rare commodity; make the recipe a secret known only to a few. The first, and probably the most obvious, element that is opened up when your choose to write Gunpowder Fantasy is the use of gunpowder weapons. From the arbuequs to the rifled musket, from simple smoothbore cannon to rifled barrels and siege mortars, the use of gunpowder weapons can have an effect that varies greatly on the path of your story. The first form of gunpowder weapons to consider is the artillery. Where in the “Gunpowder Era” you decide to set your world will determine your overall tech level, but even within those bounds there are many different types of artillery. Smoothbore cannons, mortars, howitzers and rifled cannon are all options for your world to employ in artillery. Each of these types will have advantages and disadvantages that will have an effect on your world if you choose to add them to your armies. Howitzers, for example, are typically shorter barreled, used to lob rounds at a steeper angle while not suffering from the short ranged mortars. In the Griffins & Gunpowder universe, I decided to forego the use of howitzers and my armies have to fight their battles accordingly. Earthworks become more important as it is more difficult to get rounds to fall directly behind them. This makes trench warfare more effective. Choosing an earlier type of man-portable gunpowder weapon (say, the arbuequs) will leave your world more open to traditional medieval warfare (swords, bows and arrows, etc). This would be a more ideal setting for a warrior-type main character, someone who is going to be in and among the fight. Battles will be long and bloody and involve a great deal of hand-to-hand fighting. Later weapons, such as rifled muskets, will create a major shift in the strategies of your world and how battles are fought. Gone will be the days of constant close fighting, and in will be the battles of tight formations of soldiers standing shoulder to shoulder and firing volleys, skirmishers with long rifles moving forward ahead of the main body to disrupt the enemy scouts and skirmishers, and the compact carbines, for quick moving cavalry attacks. Commanders will rely on strategy and manuevering, rather than brute force and superior numbers. Some of the accessories to small arms that you can consider bringing into your world are bayonets and looking glasses (telescopes). Both of these will create a twist in the way that firearms are used in your world. Bayonets make hand-to-hand combat more brutal and makes your infantry more powerful at repelling cavalry charges. Looking glasses create the possibility of sharpshooters and skirmishers. Attached to a rifled musket, looking glasses make your shooters more accurate at longer ranges. Skirmishers can be used as assassins, ordered to target the officers and commanders of the enemy force before they engage the main body of troops. Or they can be used as scouts and screening elements, the eyes and ears of the army who harass the skirmishers on the other side of the field and prevent them from learning the strength and dispositions of the armies. The last element of small arms to consider are the pistols and/or revolvers that will be used in your world. Like the other types of weapons, pistols and revolvers will be determined by the level of technology that you set for your world, but in the gunpowder era, revolvers and pistols were typically ahead of the curve. There are two things to take into consideration when you’re planning out this part of your arsenal: do you want to use revolvers? If so, do you have these revolvers muzzle-load or use cartridges? Cartridge revolvers will increase the speed that the revolvers fire and reload at. Pistols and revolvers were typically more expensive, which means that they were typically used only by officers and nobility. Whether you continue this into your worlds is up to you, but even an entire army armed with revolvers will have little effect on the flow of a battle until they are nearly too close to worry about reloading the weapons. In the next article, we’ll talk about some of the other aspects of Gunpowder Era technology that can be incorporated into your world, including steam power and telegraphy. Magic has been in fantasy from the very beginning of modern Fantasy. C.S. Lewis and JRR Tolkein both made extensive use of magic in their worlds. So it would be natural that Magic would be another element of traditional fantasy that can be used to connect your Gunpowder Fantasy to the bulk of Epic Fantasy. The exact nature of your magic system is up to you, but there are a few major points that you need to address when you’re building a magic system. First, and with everything in your world, you have to make sure that you are consistent. If magic works one way at the beginning of the book, it needs to work the same way in the middle and at the end. The Prevalence of Magic is usually one of the first aspects that I approach when I am building magic into one of my worlds. How common are magic users within your world? Are there mages and witches and wizards in every town and village? Or are they rare? Or is magic thought to be extinct except to a very select few? One aspect of your world that will be affected by the Prevalence of Magic within your world, and one that not everyone considers when they are building their world, is the Impact on the technology of your world. If magic is extremely common, then technology will develop differently and perhaps more slowly than in a world where magic is rare or nearly extinct. Why develop improved weapons when everyone can cast a fireball with their minds? Something that will affect and be affected by the Prevalence of Magic, is the Source: how does one go about becoming a magic user. Is it a natural gift? (Here you can increase or decrease the prevalence of magic by deciding on how common the gift is.) Is it a knowledge based system that only requires study and how common are the books that teach magic? Is Magic only gained through some ritual and how difficult are those rituals to perform? Lastly, can magic only be gained through some accident or event? This particular source would be best paired with magic that is very rare as accidents can’t be controlled. With the Prevalence and Source of Magic decided, another aspect that must be approached is the Energy of Magic. What gives the user the ability to cast their spells? Do your magic users have to carry talismans of power? Do they need to draw their energy from themselves or from the people around them? This can be another factor in the Prevalence of Magic. A system that is learned by anyone is all well and good, but if it relies on certain talismans that are very rare, then very few will be able to learn. Limits of Magic is an aspect of your system that is very important. Magic systems without limits can become boring quickly if there is nothing to keep magic users in check. Even stories where the magic users seem to have unlimited power should have some weakness, otherwise the story can’t progress. Limits can come in many different forms, several of which are similar to the Source of Magic and can tie into Prevalence. Your magic system can be limited by Knowledge: mages must learn spells and those scrolls or tomes can be rare. You can limit your magic through the Energy of Magic: if the mage has to draw from their own energy, at some point they should become exhausted and unable to cast new spells. You can use other magic-users as a Limit: anyone who grows too powerful or too reckless can be put down by other magic users. An aspect of your magic system that is more open to personal interpretation is Divisions of Magic. This aspect isn’t integral to the system, but can add flavor to it. You can have your divisions “hard”: magic users can only draw from a single school or aspect of magic. Soft divisions allow magic users to draw on any aspect that they have access to (this ties into your Source and Energy categories). The magic system that I use in my Griffins & Gunpowder universe is rather limited. I would rate it as “Rare” Prevalence: only a certain, random portion of Elves are born with The Gift. This covers both the Prevalence, Source and Impact: technology in this universe has advanced to rifles and early steam power. Magic users can draw from energy within themselves, and can “store” this energy beforehand to have ample supply, and some can draw on the energies and emotions of those around them. Magic users in the Griffins & Gunpowder universe are limited by both energy and knowledge. They will quickly burn through even the largest “stockpile” of energy and must study spells to perfect them. This is further complicated by the fact that magic users have a Major and Minor aspect that are randomly drawn from one of the four divisions: Shadow, Light, Life and Death. Books teaching each of these aspects are rare and the magic users have to learn prerequisite spells before they can learn more advanced selections. So, when planning a Magic system remember to maintain consistency and consider each aspect of your system and how it impacts the other aspects and your story in general. I was considering folding this discussion into the “Settings” part of my little series here, but I decided to give Mythical Creatures their own quick discussion. Dragons are probably the best known mythical creatures used in Fantasy. They’re iconic. But there are many other types of mythical creatures that can be used to tie your Gunpowder Fantasy to mainstream Fantasy. Going through the Pantheon.org Beastiary is a great way to find mythical creatures that could fit into your world. You can use these mythical creatures as they were originally believed to be or you can turn the stereotypes on their heads and use your mythical creatures in a completely different way. I would suggest keeping the more popular mythical creatures at least vaguely similar to their more popular myths, but it’s your world.